An eager crowd mills about outside, weaving through the spaces outside Bassline in Newtown, watched over by a diminuative statue of the iconic Brenda Fassie. The show sold out hours ago. Unhappy punters shuffle around the entrance trying to hustle their way inside. Those who got their hands on the golden ticket and made it inside are thrilled; the excitement and tension as palpable for them as the participants. A few carry handmade placards brandishing the names of their favourite crews. Fans mingle with family as the young and old jostle to get inside, letting out shrieks everytime a celebrity jostles past them for a better view of the stage. 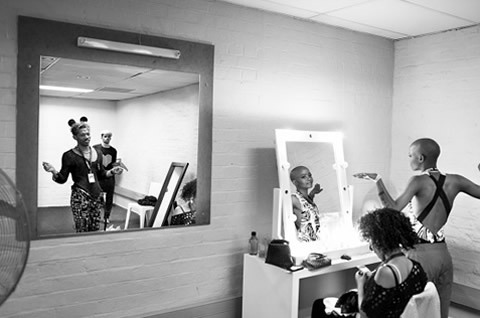 Inside the Bassline, the eight crews are dotted around the cavernous backstage. Some stretch, lengthening their bodies, working out the nerves and the kinks. Some use the final minutes to iron out any glitches in their routines. Legs and arms up against walls. Heads bobbing, turning from left to right. Others lie on the couch, eyes closed, trying to find some kind of calm and quiet. 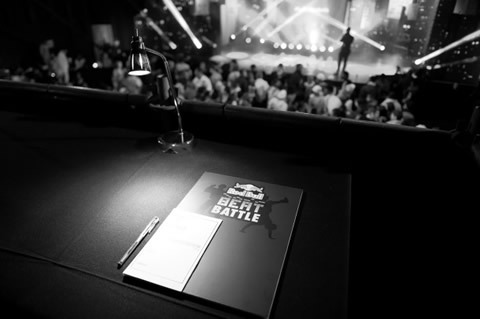 Minutes away from the beginning of the second Red Bull Beat Battle, the anticipation, excitement and anxiety crash into each other in the air, creating a friction so electric it threatens to explode! And then, just like that, it’s time. The Kliptown Youth Programme Gumboot Dancers open the show. Emcee for the night, AKA announces the eight competitors to rapturous applause. Artistic Intelligence, Ninja Turtles, Soulistic Fushion, Hlaks, Reptilez, Phly Nation, V.I.N.T.A.G.E and Real Actions Junior take the stage. Round one is a showcase. The crews introduce themselves, proving exactly why they deserve to be here. Round 2 the battle begins. We get to witness the true creative flair and skill of these dancers. Not to mention the variety of styles on display. By a random draw, Phly Nation, the all girl Tshwane crew, is pitted against Ninja Turtles, the iKapa B-boys. 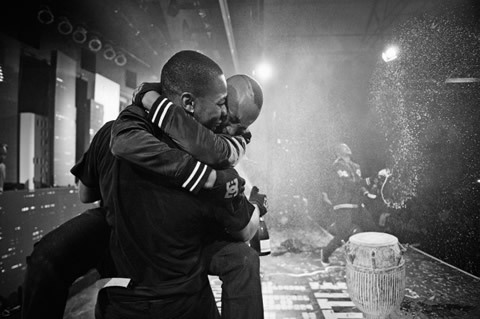 Jozi’s eclectic multi-disciplinarians, V.I.N.T.A.G.E take on the reigning champs, A.I. White City hip hoppers, the Reptilez battle Orange Farm pantsulas, Hlaks. And finally Dobsonville iSbhujwa crew Soulistic Fusion goes toe-to-toe with the other youngsters in the competition, Real Action Juniors pantsula crew from Orange Farm. The Ninja Turtles use props, gum boot dancing, comedy and a “Red Bull gives you wings” narrative in their explosive and athletic b-boy routine that edge them into the 3rd round. 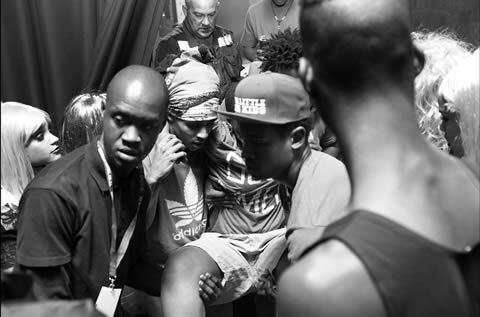 A disastrous landing left Thando from Phly Nation injured, and in a show of camaraderie, she is carried off by the Ninja Turtles b-boys. V.I.N.T.A.G.E explodes onto the stage, and forebodingly tears up a banner that reads “RIP A.I.” Their prediction comes true as the judges go against the chanting crowd and give the round to the exuberant wacking and vogueing dynamos. The Reptilez then deliver a high-energy and tightly synchronised performance that sees them triumph over the co-ordinated is’pantsula moves of Hlaks. The routine from The Reptilez typifies the increased aggression and competitive arrogance that defines the Battle Round. In the final battle of Round 2, the slick and smooth movements of Soulistic Fusion gains the isBhujwa crew the full five points over the young pantsulas from Orange Farm, Real Action Juniors. Cape Town kwaito crew, Ruffest captures our attention and rocks the crowd while the judges tally the votes. Backstage, tension and focus has replaced the initial butterflies as the crews wait to find which four crews will make it to the next round. War cries bounce off the walls, and a few tears are shed. A.I , Ninja Turtles, Reptiles and V.I.N.T.A.G.E live to dance another round. Phly Nation, Hlaks, Soulistic Fusion and Real Actions Juniors are going home. Sad that none of the homegrown styles like iSbhujwa or Pantsula made it through to the final rounds. The 3rd round is straight up brutal. Despite excellent routines from The Ninja Turtles and, reigning champs, Artistic Intelligence, both crews fail to match the intensity and focus of their competitors and get ceremoniously knocked out of the tournament. This means that a new dance crew will get to hoist the Red Bull Beat Battle Drum and make their way to Brazil to witness the Red Bull BC One final later this year. The final is tense. The multi-disciplinary wackers and voguers of V.I.N.T.A.G.E switch up their routine, and put on a very cerebral and contemporary show. Swathed in lace-layered red robes, they slide and glide over each other. It’s a departure from what we’ve seen so far. A fluid set of movements that is very different from the camp, exuberant performances that got them this far. It shows their diversity as dancers, but will it be enough to clinch the title? The Reptiles have also mixed things up for the final.  Their routine is characteristically tight, thematic and theatrical. They move like a five-part machine, working in-synch. A domino effect of firm, tense control, interspersed with flips and power moves. The crowd begins to intone, “ReptiIez! Reptilez! 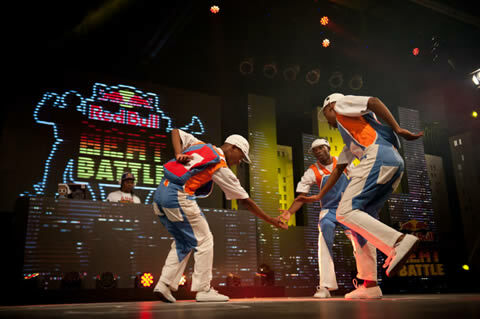 Reptilez!” And after mind-blowing sets by by Black Motion and Pro, it’s time to find which dance crew reigns supreme. The crowd vote gives it to Reptilez, a sea of Blue placards waves through the audience. The boys begin to jump around on stage. Kabelo gives it to V.I.N.T.A.G.E, but his one vote won’t be enough. 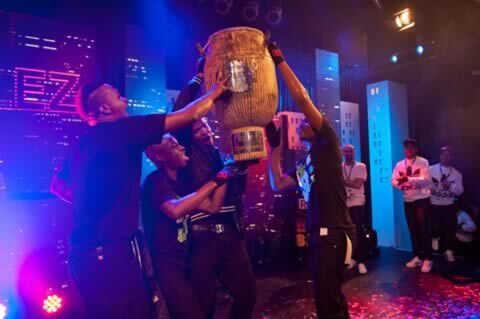 The other judges; Lorna Maseko, Vouks NoJokes, and Somizi all hand the drum over to Reptilez. 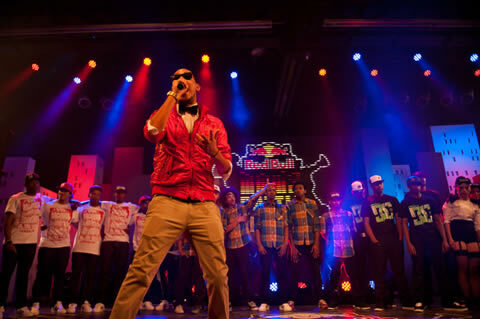 And so after a night of upsets, surprises, and high quality entertainment, Red Bull Beat Battle drew to an end. The competition that is, the party had only just begun. 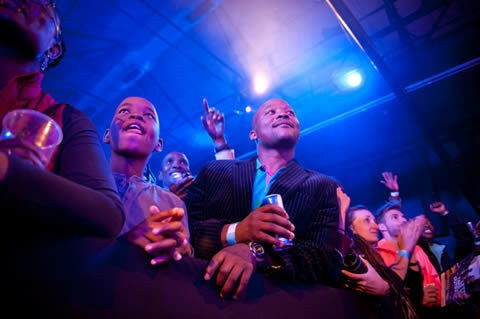 Both Big NUZ and TKZee kept the crews and the audience on their feet long after the drum had been banged by The Reptilez.